Young pretty business lady talking via internet. Young friendly blonde in formal wear using digital tablet on blurred background. Video chat with business partners. Smiling woman talking via internet. 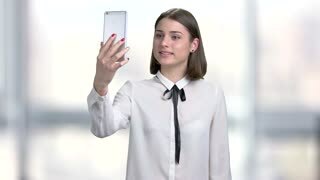 Young beautiful woman with dark hair having video chat on smartphone, blurred background. Young woman holding smartphone and talking. Beautiful young lady in formal blouse talking via internet, blurred background. Excited young woman talking via internet. Young business woman having conversation via video chat conference at office. Focused blonde businesswoman using tablet pc. Young pretty elegant business lady talking via skype with partners on green screen background. People, technology, lifestyle. Beautiful business lady talking via internet. Young cheerful blonde woman having conversation via computer tablet on chroma key background. Young pretty business lady talking via internet. Happy smiling young woman in formal wear using digital tablet on blurred background. People, technology and lifestyle. Beautiful business lady using computer tablet. Cheerful blonde in formal wear talking via internet on grey background. People and modern technology. Attractive business lady talking via internet. Young elegant woman using digital tablet on office window background. People, technology and lifestyle. Friendly mature man talking via internet. Smiling senior man using digital tablet on office window background. Conversation with business partners.